If you have been using Teamup Calendar for free and are ready to subscribe to a Teamup Plus, Premium or Enterprise plan, you can upgrade your current calendar without creating a new calendar. Once your upgrade is complete, you will be entitled to the additional sub-calendars and all features of your plan. There will be no data loss or setting changes to your calendar. 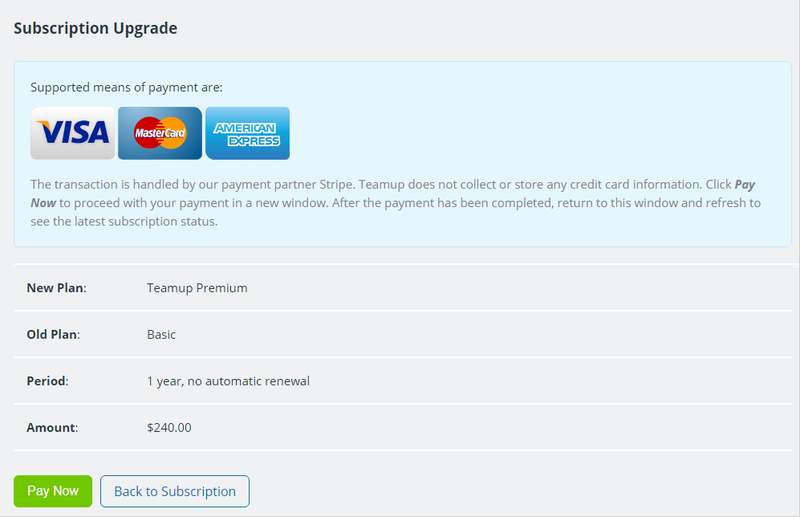 The same procedure applies to subscription renewals, when you click the Renew button instead of Upgrade. Go to Settings (open the menu icon on the top right corner, available from a calendar administrator‘s link). Click the Subscription tab, at the bottom of the sidebar. Click Pay Now and follow the onscreen instructions to complete the payment process. As soon as your payment is confirmed, your subscription status will be adjusted and all respective features will be enabled for you automatically. If you don’t see that happening, please reload your page. If you are renewing your subscription after it was expired, you may need to go to Settings > Calendars to re-activate any calendars that may have been de-activated. Please note: We have had reports of up to $2 being additionally charged by customer banks; this is often due to cross border transactions. We do not charge any extra than the price stated. Contact support@teamup.com if you need any assistance. Thank you!